This review is about item#5818863. This review is about item#5818881. Since there are multiple tire gauges, the instructions are subtly different from each other, so I bought it because I wanted the standard one. I bought a pressure gauge saying an error of ± 2.5%, and made it by adding some other materials including this. As a result, it seems that none of them are within the range of error, but recently purchased one is the guideline which is closest to this barometer, so I will use it primarily. This review is about item#5818976. Used for joint with air gun. There is no problem with screw performance. There is no leak without using seal. Once tightened to fit in the 1/4 screw hole, the 3/8 nut portion broke from the root. This review is about item#5818967. It is an ordinary commodity, it was clean without rust. It is not a bad product. Packing was too good and just plain salt plum. The quality was also good and refreshing work was completed. I would like to purchase again. It is superior to C / P for use in temporary piping during hydraulic test. 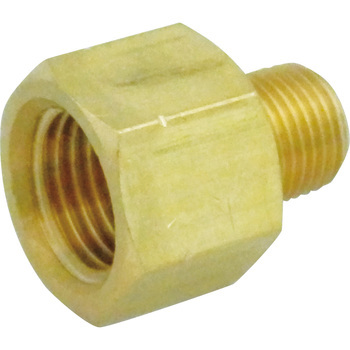 Purchase to create an external source inlet for gas gun. I could make it as I thought. I think that it is a very accurate product at the end without loosening I was satisfied I was able to use it. Since the air cleaner attached to the silent type air compressor crashed merely because it collided lightly with a thing made of plastic, an adapter was necessary to replace it with a metal air cleaner and used this product. I think that there is no problem if you purchase necessary items after checking the size. I am satisfied that it can be obtained cheaper than my neighbor's home center. This review is about item#5818951. In the nearby home center, we do not find the things we want very cheaply and are very useful in shipping fast. There is no problem concerning goods in a firm build. It was good that searching for products was easier to find than HP's table. This review is about item#05818881. It is used to change the size of the piping of the mound. Size fitted perfectly and no problem. This review is about item#5818933. It was a very good product. There was a special socket which is not placed in the home center etc and it was very helpful to Mr. Monotaro. Thank you very much. We also order various parts, parts etc. This review is about item#5818872.